Some animals add extra fat or blubber to maintain their heat during the cold. 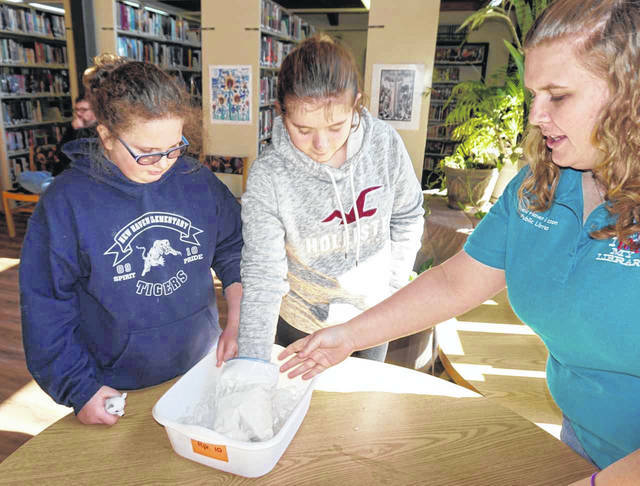 Pictured is Library Clerk Racheal Zerkle, right, as she helps Becky Miller, left, and Emma Northup, center, with a “blubber glove.” The glove, filled with lard, kept the girls’ hands warmer when placing them in a tub of ice water. 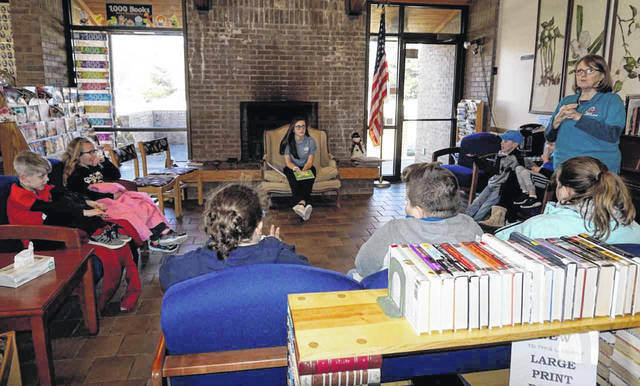 Wahama High School student Abbie Lieving, pictured in front of the fireplace, prepares to read a book to the children attending the program “Animal Edition, I Survived: Winter,” at the New Haven Library on Friday. 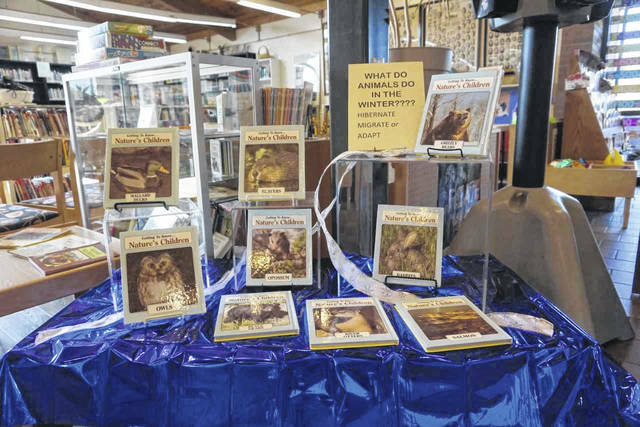 The event was hosted at each of the three county libraries, which also includes Point Pleasant and Mason. Library Clerk Sheila Roush is pictured at right, as she introduced the children to the program. Children learned about how some animals adapt their color during the winter to blend in with the snow and keep predators away, led by Wahama student Mary Roush. The children are shown digging through the tub of cotton “snow” to find the white felt animals. 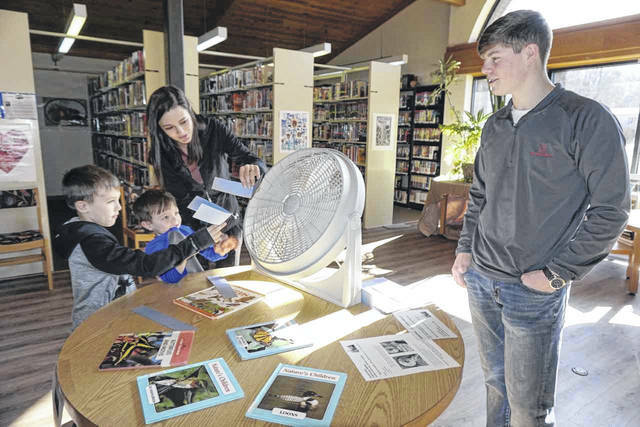 Wahama student Zachary Roush manned the migration station at the New Haven Library program. Children held up “V” shaped strips of paper in front of the fan to demonstrate how the birds do not have to flap their wings as hard against the wind when traveling in that shape. 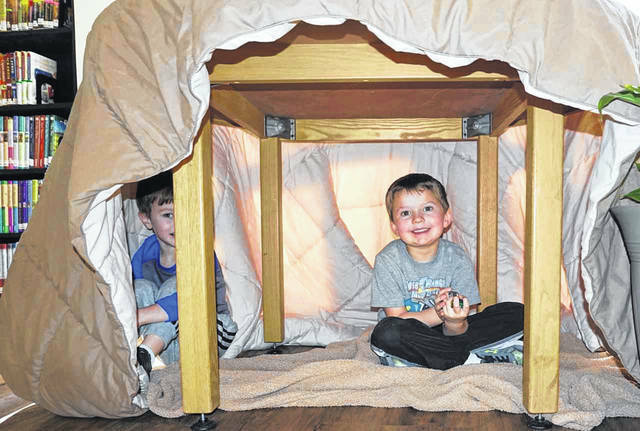 A makeshift “cave” provided children with an example of how some animals stay inside during the cold weather conditions to keep safe over the winter months. Children colored and crafted their own winter spinner wheels to take home and remember the ways animals in the wild handle harsh winter conditions. 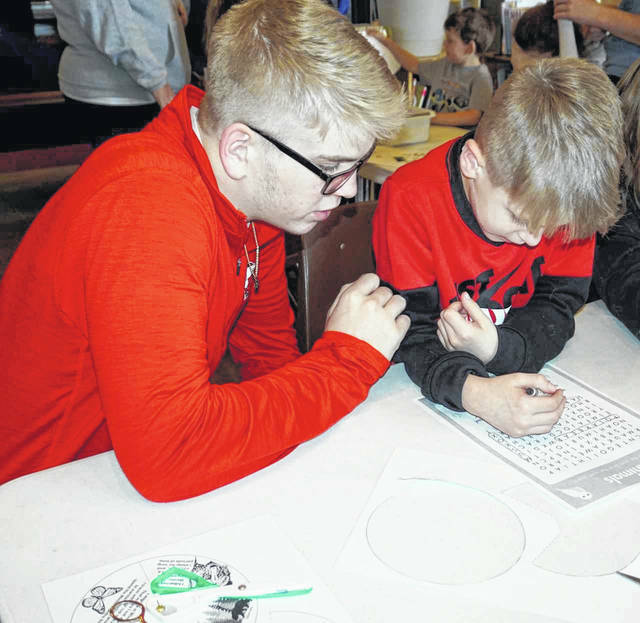 It was brother helping brother at the New Haven Library program Friday, as older sibling Brennan Grate, left, helped Brantley Grate with a craft. 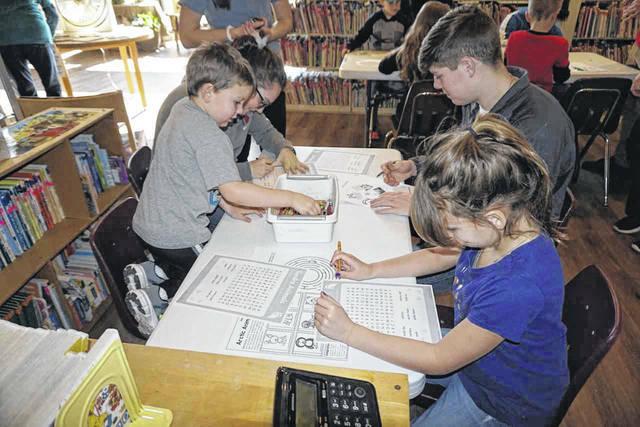 Word search puzzles and other activities were provided to children at a library program Friday at the county’s three locations, Point Pleasant, Mason and New Haven. Pictured is a scene from New Haven, as high school students help the children. MASON — Migration, hibernation, adaptation. Children learned these are the ways animals in the wild survive winter conditions when the Mason County Libraries presented the program, “Animal Edition, I Survived: Winter,” on Friday. 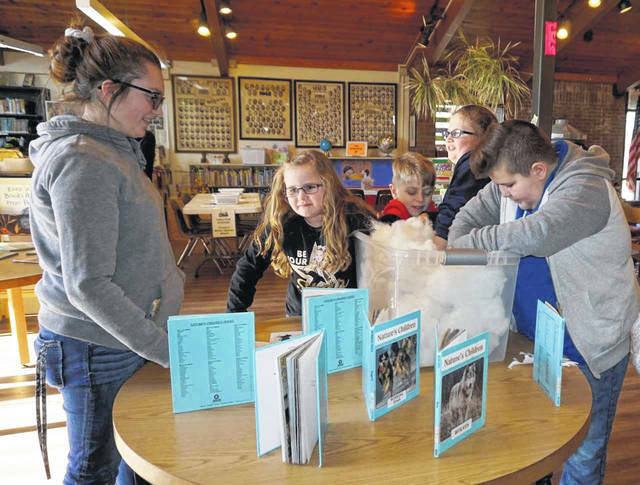 The event coincided with a three-hour early dismissal day in Mason County Schools, and provided elementary age students with an afternoon of learning and fun. The program was a part of “Kids Connect” in the local libraries, which has encompassed everything from special events, like building gingerbread houses at Christmas, to learning experiences, summer reading and story hour. “Kids Connect” is funded with grant money provided by United Way of the River Cities. 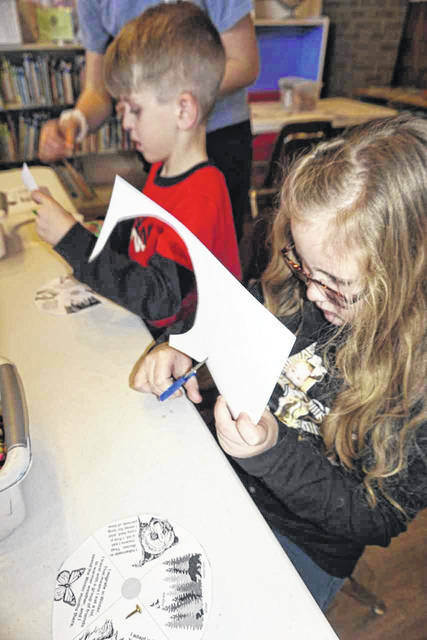 The animal program was held at each county library location – Point Pleasant, Mason, and New Haven. At New Haven, three students from Wahama High School, Abbie Lieving, Mary Roush, and Zachary Roush, assisted in exchange for community service hours. Children were first led to an area where Lieving read the book, “Do Frogs Drink Hot Chocolate, How Animals Keep Warm.” Following the book, the kids were invited to various stations for learning and activities. The migration station, manned by Zachary Roush, told how birds fly long distances for many days to reach warmer climates. They travel in a “V” shape so they don’t have to flap their wings as hard against the wind, and even take turns being in the front. As a demonstration, the children held “V” shaped strips of paper up to a fan to see how the wind affected the paper. The hibernation station, led by Library Clerk Racheal Zerkle, showed how certain animals add extra fat or blubber to their bodies to keep them warm. The children experimented by first placing a hand in a container of ice water. Next, they placed the hand into a “blubber glove” filled with lard to show how the extra fat kept their hand warmer when placing it back into the ice. Finally, they entered a makeshift “cave” to hunker down for the remainder of the cold weather. Games, puzzles, and coloring and crafting their own winter spinner wheels finished the afternoon. Library Clerk Sheila Roush presented each child with a new book, bookmark, and treat bag before leaving. Other programs are being planned for future school early dismissal days, and will be announced on each library location’s Facebook page. For information on all library events and services, call the Point Pleasant library at 304-675-0894, New Haven library at 304-882-3252, and Mason library at 304-773-5580.